Once the end of the summer arrives I'm always looking to the next thing to celebrate and have fun with, because as the nights start to draw in, things can feel a bit gloomy. So as we move through September, my thoughts always turn to Halloween and Bonfire Night, both wonderfully fun times of the year. It's a great excuse to dress up and decorate the house, we've taken to carving pumpkins every year now and I think we might do a few fun Halloween games this year too. 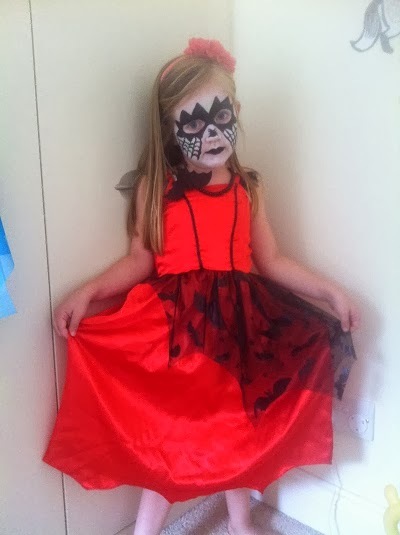 Isla was sent a brilliant dress for Halloween from Aldi. Blood red with lots of bats on the netting, and it was accompanied by a bat necklace, which she loved. 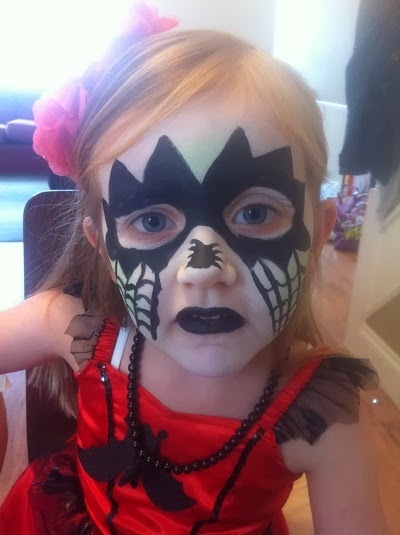 In order to make our dress up session all the more authentic I decided to crack open the Snazaroo face paints that I bought well over a year ago and get brave and give her a spooky face to go with the fiendish costume. I don't think it was too bad an effort actually! Noah got in on the act too with his Jake and the Neverland pirates costume! 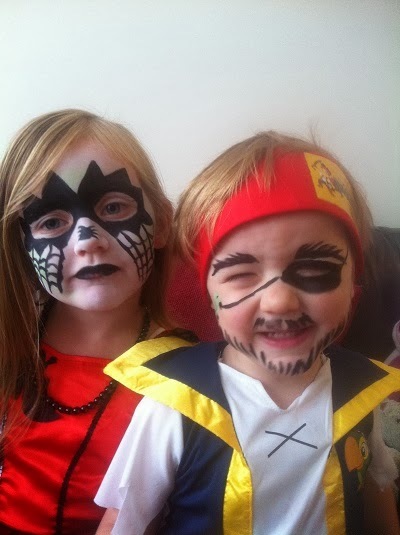 They both love an excuse to dress up and they stayed like this all day! It really is worth checking out Aldi if you need to pick up some Halloween costumes or decorations for a party. The prices are so reasonable, probably so much so that they will fly off the shelves, so I'd get there quick if I were you. Noah has a Halloween tea party at nursery, so I will definitely be popping along to see if i can pick up something for him; with the kids outfits starting from £3.99 you can't really go wrong. We were sent the outfit Isla is wearing and a couple of accessories that I will be showing in another post soon. All words and opinions are my own.